The Future of Security Printing. Both overt and covert options are available for a layered approach to document security. The need for secure printing is essential to few, and an occasional concern for many. However, those that need these features rely on the latest technologies to ensure secure applications. Security measures are called upon in many forms to protect brands and consumers against fraud and counterfeiting. Print is no exception, and new tools continue to emerge to combat theft. Both overt and covert options are available for a layered approach to document security. Many digital production press manufacturers offer features that fall under the security umbrella and are visible to the naked eye, including specialty inks, magnetic ink character recognition (MICR), and micro printing. Additionally, covert features found in digital inks and toners offer invisible characters that are only recognized with a special device or application (app). 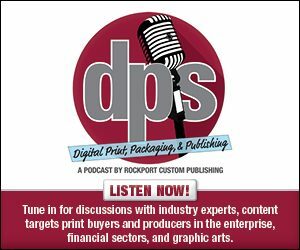 In the October issue of DPS Magazine, which hits the streets on September 20, 2016, we discuss the need for security functions in the digital print environment, as well as features and products available to address that. We tease the article with a discussion on what the future will bring in this area. Ed Jansen, VP, professional services, Canon Solutions America, suggests that an increased need for security around the world as well as the ability to certify and protect personal identities, intellectual property, and monetary value items is driving the need for secure document printing. Jim Reiman, director of brand protection, Sun Chemical, says counterfeiting and diversion are at the heart of what is driving interest in security printing products—and with good reason. He explains that counterfeiting threatens public health through the production of inferior medicines, foods, and beverages; causes taxes to increase by sidestepping official channels; increases public spending by boosting enforcement to counter the illicit trade; and raises the price of legitimate products and brands that seek to recoup their losses. “The problem of counterfeit products cuts across all industries and can be found in a range of diverse product types,” suggests Reiman. He says that in fact, some of the industries that are most vulnerable to counterfeiting include automotive parts, alcohol, computer hardware, mobile phones, packaged foods, pharmaceuticals, and tobacco products. “With profits, corporate liability, and brand reputations at stake, more companies are fighting back to protect themselves. Brands are increasingly expanding their budgets for confronting both counterfeiting and diversion issues by being more proactive in applying technologies to ensure the supply chain is safe and legitimate,” he shares. Packaging applications represent one area where brands can protect themselves with anti-counterfeiting technology. “We definitely see a growing request for brand protection features from printers in our label and packaging segment. It is clear that more brand owners are confronted with counterfeit goods, resulting in profit/image damage,” comments Jeroen Van Bauwel, director product management, Xeikon. He says the package is the “perfect container” to implement anti-counterfeit tools, especially for those already created digitally. This is because digital print technology is already in use and therefore the cost to implement security features can be low. This trend is also acknowledged by HP, based on a recent memorandum of understanding (MOU) that debuted at dscoop 2016. “Packaging across many industries, particularly for pharmaceutical products, is an area of demand for security and anti-counterfeiting applications. Pharmaceutical companies can increase product safety and brand protection by investing in packaging and printing, which assures the supply chain and consumers that their drug or product is authentic,” explains Thomas A. Nicolette, president/CEO, VerifyMe, in a press release announcing the MOU. The need for secure printing is apparent, and new technologies enable brand owners and print providers to offer anti-counterfeit and fraud solutions that are simple and affordable. Jim Reiman, director of brand protection, Sun Chemical, suggests unique marking and digital smartphone authentication are the fastest growing and most intriguing solutions to brand owners trying to combat counterfeiting and diversion. “The reality is that they are losing control of the production process. The exploding of good counterfeit products is making it look credible enough for customers to buy it. Consumers have a difficult time determining what is real and what is fake,” he warns. Anti-counterfeiting tools help brand owners better supply their supply chain. Mike Tobin, VP of marketing, Document Security Systems, Inc., adds that solutions featuring a smartphone app are piquing interest because of the additional marketing benefits that it provides. “Brands like to know what consumers are buying and want to tailor promotions based on their buying tendencies. It also provides an aspect of service to the individual that wasn’t available before,” he offers.